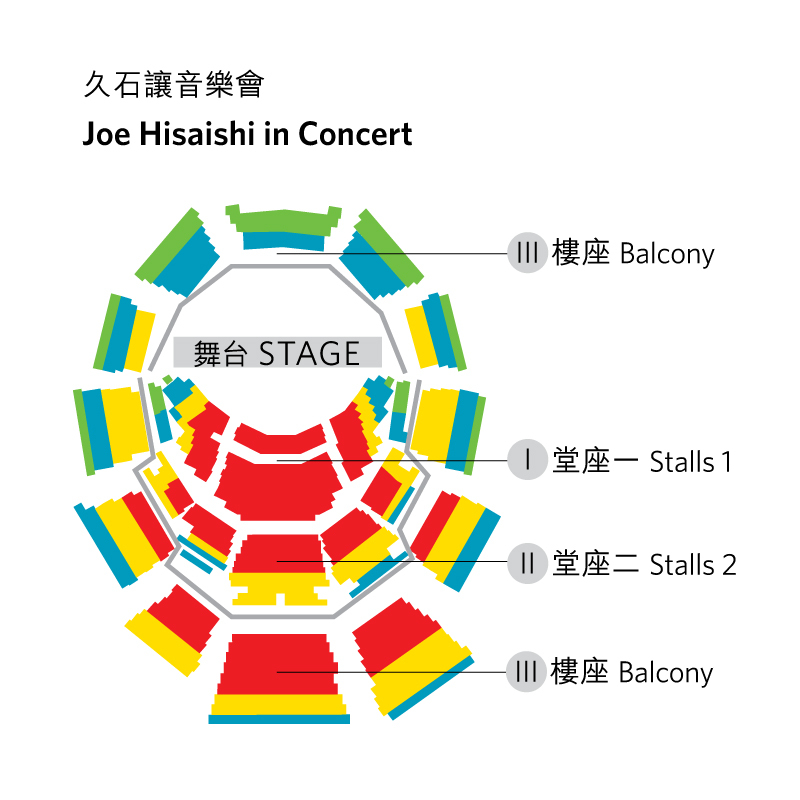 Due to unpurchased tickets during the previous Ticket Ballot procedure for the Joe Hisaishi in Concert 5 May 3pm performance, 238 tickets (131 $1,080 tickets, 50 $880 tickets, 46 $680 tickets and 11 $480 tickets) will be made available for public sales on the concert day (i.e. 5 May) from 10AM at the URBTIX outlet of the Hong Kong Cultural Centre (not available for sale via internet, ticketing app and telephone booking service). Tickets are sold through real-name and first-come, first-served basis. These tickets can only be purchased IN PERSON with a valid photo ID (true copy). Each person can purchase a maximum of 2 tickets, and the English full-name (which matches the name of the concert-goer on his/her photo ID) of the fellow concert-goer must also be provided during purchase to be printed on the tickets. These names will be verified during concert admission. 【Important Admission Info - You are suggested to check-in at 12:30pm】All ticket holders of 5 May 3PM performance must bring along their valid photo ID (true copy) for admission. Venue staff will check the name on the ticket against the name on the photo ID (true copy). Admission will only be allowed after successful verification. It is highly recommended to arrive at the Hong Kong Cultural Centre 2.5 hours prior to the performance (i.e. 5 May 12:30pm) for check-in to avoid a long queue. Audience members who are successfully checked-in can freely hang around Hong Kong Cultural Centre area and return to the Concert Hall at a time closer to the concert commencement. As we are expecting a crowded and lengthy admission process, if audience members do not reserve sufficient time for verification which leads to delay entry, admission can only be made until a suitable concert break. Thank you for your patience and consideration in making the pilot Real-Name admission possible. Thank you for your support! Tickets for the three performances (4 & 5 May 8pm and 6 May 3pm) have already been sold out. 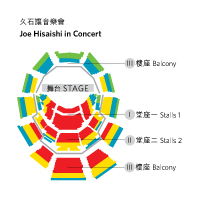 Tickets for the additional performance of Joe Hisaishi in Concert on 5 May 2018 3pm will be sold through a pilot implementation of Ticket Ballot and Real-name Ticketing System. This unprecedented ticketing measure shows our determination to prevent unofficial reselling of tickets and aims to ensure that tickets will be made available only for those who genuinely would like to enjoy the concert. 80% of the tickets will be made available for public purchase via this ticketing procedure. Online registration for ballot ended. Please note that tickets for the concert on 5 May 2018 (Sat), 3pm will only be available at URBTIX. There are no other ways of prior booking or redemption offered via any other collaborators (e.g. credit card company) except URBTIX. Japanese composer-conductor Joe Hisaishi makes a triumphant return to the HK Phil following his sensational first appearance here in 2010. All four concerts will feature three orchestral pieces composed by Maestro Hisaishi. The first half will be the Hong Kong premiere of The East Land Symphony, a composition of Maestro Hisaishi in 2016. 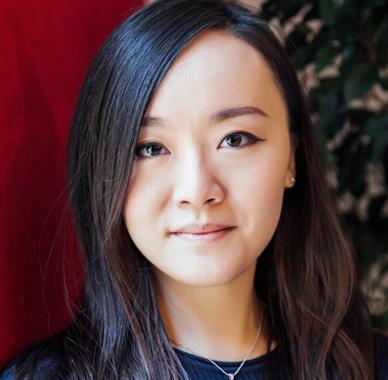 The grand orchestral piece consists of five movements, in which the Hong Kong soprano Louise Kwong, active on local and international stages, will be featured as the soloist. mládí for piano and strings gathers three pieces which the Maestro composed for the great Japanese director Kitano Takeshi’s films, namely Kikujiro’s Summer (or simply Summer), Kids Return and Hana-bi. The core piece of the second half will be the Hong Kong debut of the newly arranged Symphonic Suite Castle in the Sky (2017), drawing together the Maestro’s compositions in the famous motion picture Laputa, including the beautiful piano part to be played by the Maestro himself, creating an exceptional musical journey through the castle in the sky. 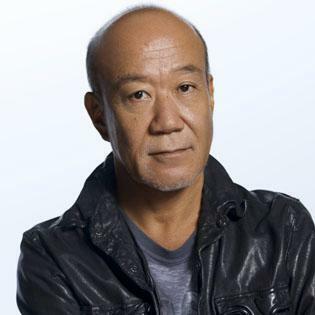 Urbtix is the only authorized platform of the sale of Joe Hisaishi concerts. The HK Phil is intended to share the joy of classical music with the public, promoting classical orchestral music to the wider public. Ticket touts are exploiting the wider public of their right to enjoy music. Unofficial re-sellers may replicate or reproduce invalid tickets. Any person presenting any replicated tickets or unofficial tickets will be denied entry. Members of the public are advised against purchasing tickets through unofficial channels. HK Phil hereby condemns all ticket resellers and touts, and will consider taking legal action against the touts. Please do not encourage ticketing touts.